I am a member of the Collective Bias® Social Fabric® Community. This content has been compensated as part of a social shopper amplification for #CollectiveBias and its client #WellAtWalgreens . All health related suggestions and opinions expressed in this post are all my own. Last week we spent part of my Spring Break at Disney World. We took advantage of the Florida Residents' Three Day Pass and to make sure we got the most out of our money, we pretty much spent 12+ hours a day in each park. Since we didn't plan on leaving the parks during the day, I wanted to make sure that we had everything we needed on hand to relieve pain and allergy issues so we didn't get stuck without necessities and so we also didn't end up having to pay high theme park prices for health and wellness items. 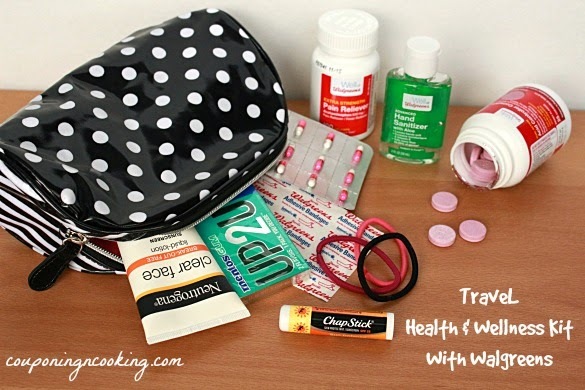 The week before our trip, I got a list together and headed to Walgreens to put together a Health & Wellness Kit to keep in our backpack for our days in the parks. During the month of March, Well at Walgreens products are buy one get one 50% off which was nice because between the promotion and my Balance Rewards card I was able to get what I needed without spending too much. 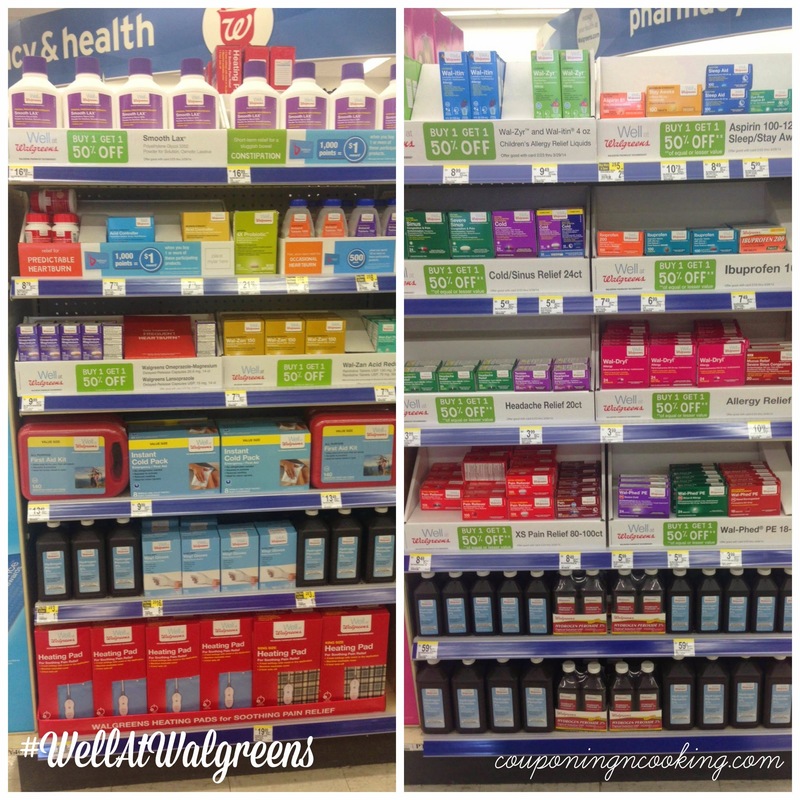 I also love that from February 1, 2011 through December 31, 2014, 1¢ from the purchase of every Walgreens Brand Health & Wellness product, up to $3 million a year, will go towards bringing preventative wellness services to local communities through the Walgreens Way to Well Commitment®. 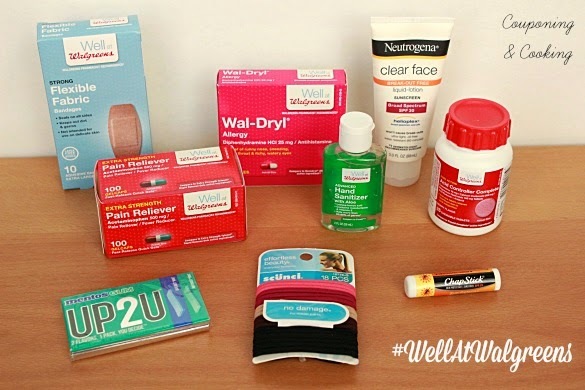 My Walgreens had a huge selection of Well at Walgreens products as well as tons of other things that I would consider a "necessity" for surviving three full days of theme parks. Walgreens Pain Reliever Extra Strength Quick Gels 100 ct: Whether it's for a headache or backache from standing in line for hours, pain reliever was a must for us. It was nice to have it on hand for the day but we really ended up needed it at night after a full day of walking and standing. Sunscreen: Even though it was nice and cool during our days in the parks, the Florida sun can burn you even on a cloudy day. It was nice to have a travel sized face sunscreen to reapply as needed throughout the day. Wal-Dryl Allergy Relief: Not only is this great for possible bug bites and general allergies, but I also have some pretty serious food allergies. I always keep this on me when we travel and when eating in new restaurants it is imperative that I have this just in case I accidentally try something without knowing what is in it. Hand Sanitizer: Thousands of people in the same place touching everything. Clearly this was very needed. We were very happy to have it when we grabbed a Mickey pretzel from a kiosk after hanging on for dear life to the dirty handrail on Splash Mountain. Walgreens Acid Controller Complete: Disney in general has some great food and dining options and that can sometimes lead to a little bit of overindulging. These were great to have on hand especially after our day at Epcot where we spent a few hours sampling small plates from around the world. Large Fabric Bandages: Theme parks mean tons of walking. These were the perfect size for the backs of our heels to keep our shoes from rubbing and creating blisters. Chapstick: Sun, wind and fast paced theme park rides meant we were constantly looking for lip balm for our chapped lips. Hairties: Many people may not consider these a necessity but when you have as much hair as I do, I consider it an emergency to be without something to keep my hair back. Gum: Because who wants to have bad breath when meeting a Disney princess? To be honest, I was actually surprised how many times we reached for this kit over the course of three days. Justin actually started to tease me because everytime he would ask for something I would respond with "its in the kit". 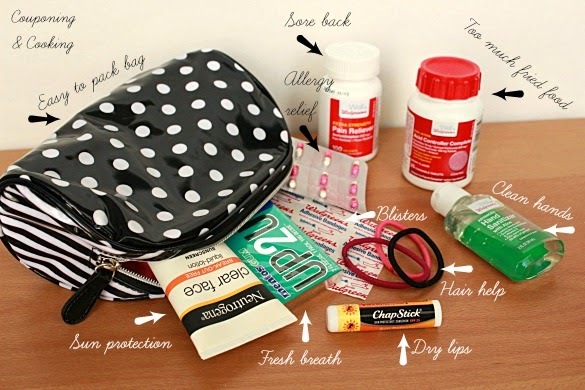 What do you keep in your travel kit? Anything you can't live without that I should add for next time?